You've already got Time Machine. Having it isn't the same as using it but we're begging you here: use Time Machine - or something else like SuperDuper! 2.9.1. Apple's own app. and third-party ones like SuperDuper!, ChronoSync and CarbonCopyCloner are all devoted to protecting your work by making copies of it. 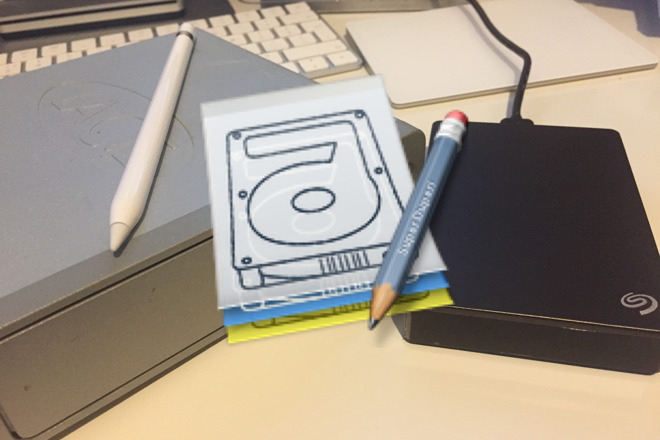 You know that hard disks and their replacement technology SSDs are critical. Yet every time Apple or any other such company changes their operating system, it's likely to affect how that OS works with these drives. So the chief update to SuperDuper! in September's version 2.9.1 version is a confirmed, official compatibility with macOS Sierra - and that is reason enough to upgrade. Plus, it's free for existing users. The job that SuperDuper! does is the same as all other backup utilities but no two of these work the same way. SuperDuper! aims to make it quick to set up a backup copying of your data and to make certain that you know exactly what will happen when you click on the Copy Now button. You may never go beyond that small main screen. From there you can say which drive you want copied to which other one. Choose these two drives and click. 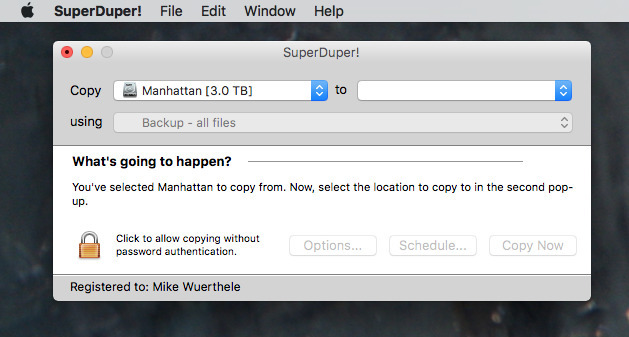 You'll be asked to enter your Mac's password before SuperDuper! will do anything, but once you have then it will back up your data. It's hard to see how that could be made easier to understand and the app does repeatedly warn you before you choose an option that could lose you any data. 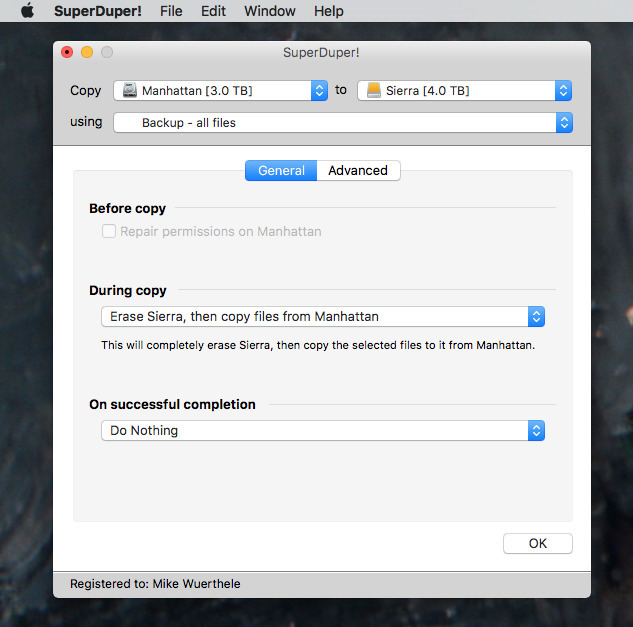 If you're connecting an old drive and telling it to backup to that, SuperDuper! will by default erase that disk. However, it will make sure you understand that it's going to do that and you have the options to stop it. The speed of setting up and getting going is important but it is in these options that SuperDuper! becomes crucial. It can't be controlled remotely nor can it email you when a backup is completed - or if there are problems. However, it can complete the backup and then eject the disk you're copying to. It can shut down your Mac. So it's good for those end of day backups when you want to go home but the machine is still copying away. 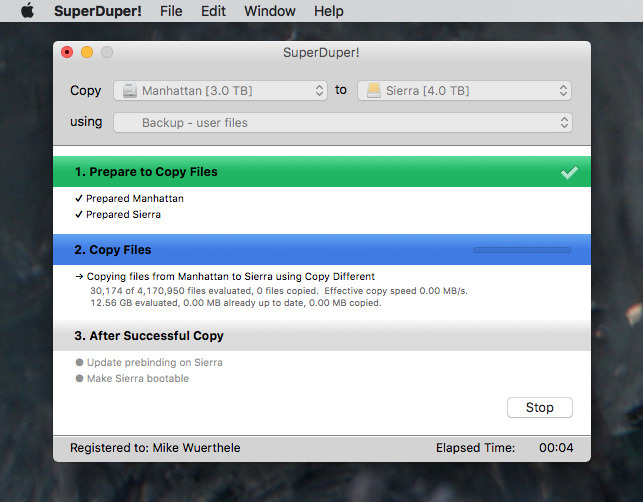 Set up a backup where SuperDuper! will do its job and then shut down your computer for you so you can get out of the office on time. SuperDuper! is a rewarding app: it shows you what everyone needs but as you want more, it gives you extra. It's not as option-laden as ChronoSync but it is powerful and easy to use. That said, we're talking about disk backup utilities here: they are never going to be child's play to use. Nor should they be when the very continued existence of your data is at stake.